Follow in the Footsteps of Giants Through Citizen Science! Elizabeth Kiernan is a project coordinator for the William and Lynda Steere Herbarium at The New York Botanical Garden. She is currently working on a program to document the biodiversity of the Amazonian region of South America. Chocolate lovers beware! Witches’ broom disease is your worst enemy. 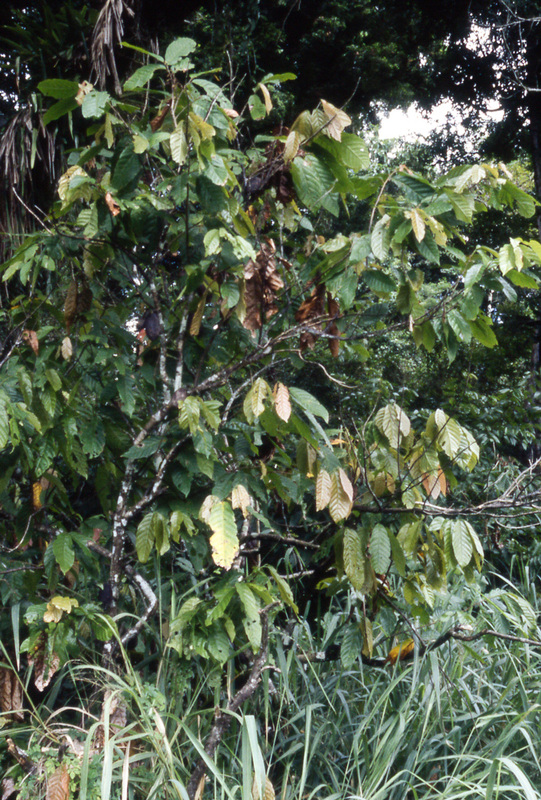 This fungal disease attacks Theobroma cacao, the tree from which chocolate is derived, and it has so altered chocolate production that in a generation no one may remember what chocolate as we knew it once tasted like. 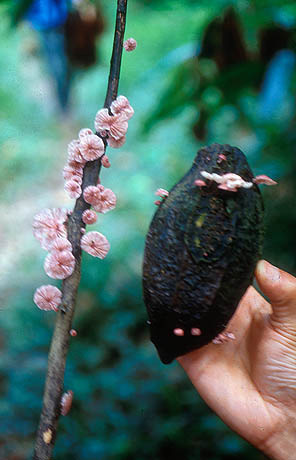 T. cacao grows in the tropical rainforests of South America and West Africa. Here at The New York Botanical Garden, several cacao trees can be found in the Lowland Rain Forest Galleries of the Enid A. Haupt Conservatory, and there are preserved, dried specimens in the William and Lynda Steere Herbarium. Humans unknowingly set the stage for the spread of Moniliophthora perniciosa, the aggressive fungus responsible for witches’ broom disease. To maximize the supply of cacao beans, which are used to make cocoa powder and chocolate, large monocultures of cacao trees were planted in South and Central America in the early 1900s from a selected handful of seeds, chosen for their delectability. This unintentionally placed the trees in a fragile position, since genetically similar populations are more at risk of succumbing to devastating pathogens. The fungus first appeared in Ecuador in the 1920s and has since spread throughout the Neotropics. 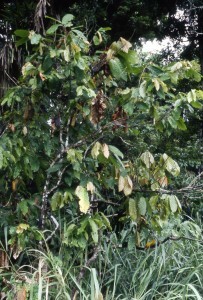 Ten years after first being spotted in Bahia, Brazil, nearly 75 percent of the native cacao trees have been eradicated. Witches’ broom disease is named for the abnormal, broom-like outgrowths that appear on infected trees. The disease cycle begins when spores of the fungus, which are dispersed by wind and water, enter the stomata—the pores of a tree’s leaves—or lesions on a tree. With high humidity and moisture, the spores germinate, and the tree undergoes severe physiological and hormonal changes, which divert the plant’s energy from normal growth to the production of the brooms. That negatively affects the cacao pods, which contain the beans used in the production of chocolate. After two to three months of infection, the brooms die, and the fungus completes its lifecycle by giving rise to clusters of pink mushrooms, which then release the spores. There is presently no known cure for the disease. Due to the devastation caused by the disease, there has been a strong push to develop more genetically resistant varieties of cacao trees. One of these is the CCN-51 cultivar, developed in the 1970s by Homero Castro, an independent researcher and agronomist from Ecuador. After years of travelling the world in search of the hardiest and most productive cacao trees, Castro was able to develop CCN-51, a super tree capable of producing seven times more beans than the native T. cacao and, most impressively, resistant to witches’ broom disease. At first, CCN-51 was hailed as a miracle tree, but unfortunately, the taste-test proved to be less than satisfactory. 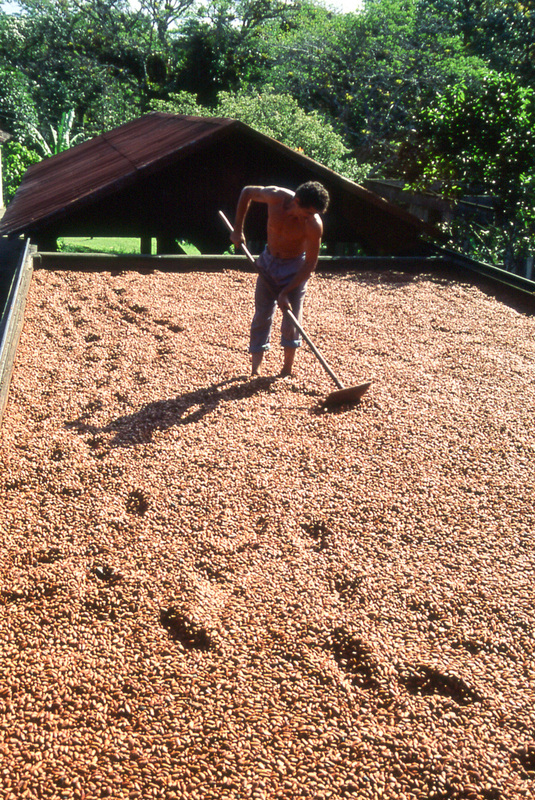 Cocoa made from CCN-51 beans was described as tasting like rusty nails or dirt. 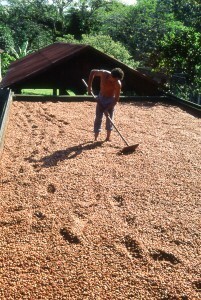 Process of drying out the cacao beans for chocolate production. By drying and fermenting the beans longer than native beans, the unpleasant taste was diminished, but the result was a bland chocolate. Faced with the shortage of the native cacao beans, chocolate companies realized that they could mask the bland flavor of CCN-51 by adding more sugar, vanilla, and cream to their chocolate. Chocolate connoisseurs are unhappy with CCN-51, but it is now used in the majority of new cacao plantings in South America. On a positive note, the excess pulp in the pods of this variety makes it ideal for producing cocoa butter. Bowers, John H. “The Impact of Plant Diseases on World Chocolate Production.” Plant Health Progress. Published on June 14, 2001. http://www.apsnet.org/publications/apsnetfeatures/Pages/WorldChocolateProduction.aspx, accessed: 2/26/2015. “Episode 601: The Chocolate Curse.” NPR. Published on February 5, 2015. http://radio.wpsu.org/post/episode-601-chocolate-curse, accessed: 3/4/2015. Garber, Megan. “The Race to Save the World’s Chocolate.” The Atlantic. Published on November 17, 2014. http://www.theatlantic.com/health/archive/2014/11/Chocolate-shortage-2020-mars-barry-callebaut/382855/, accessed: 3/4/2015). “Scientists seeks cure for devastating witches’ broom disease on the chocolate tree.” Published on October 31, 2014. http://phys.org/news/2014-10-scientists-devastating-witches-broom-disease.html, accessed: 2/26/2015.